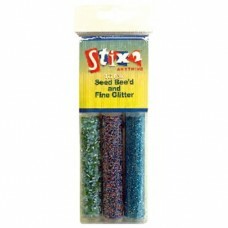 This gorgeous range of Seed, beads and Fine Glitter is perfect for all your craft requirements, including scrapbooking, card making, embellishing and all other hobby and craft projects. Ideal for use with Stix2 Ultra Clear Tape, Adhesive Sheets, PVA and the NEW Glue Pen. 3 tubes per pack approx. 30g inc container. Available in 6 different colours.